Rinse strawberries well and let them dry completely. In a small bowl melt the frosting in the microwave for 5-10 seconds or until frosting is dipping consistency. Dip the strawberries 2/3 of the way in the frosting, shaking the excess off, and then dip the top in the sanding sugar. Place strawberries on wax or parchment paper and let them set in the fridge until serving. To make your own sanding sugar, place a couple of drops of food coloring in white sugar and mix thoroughly. When the flag is flying for a national holiday, you need a treat that’s as patriotic as the occasion. 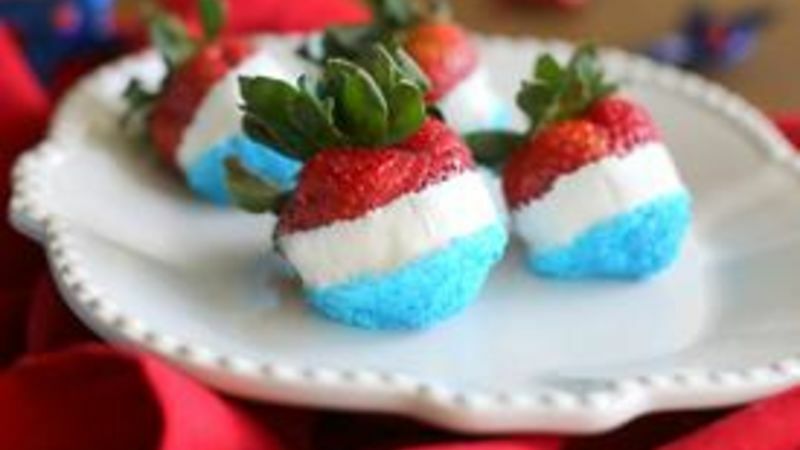 Try these easy dipped strawberries for a fresh twist on red, white and blue! I know most of you have tried chocolate dipped strawberries -- but have you had frosting dipped strawberries? They're even better! And there's no worries about melting the chocolate or having your chocolate seize up from moisture on the strawberries. 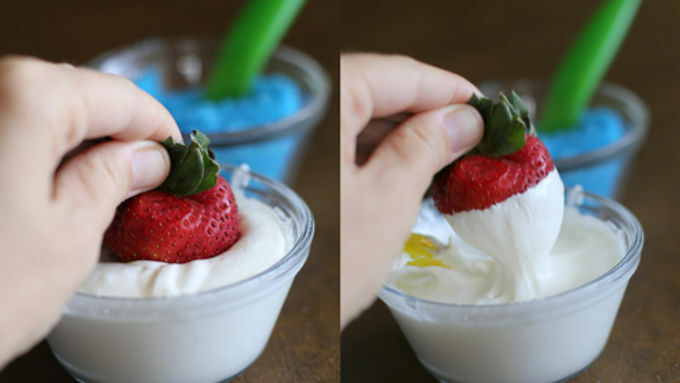 These Red, White, and Blue Strawberries are dipped in vanilla frosting and then blue sanding sugar for an easy and fast patriotic treat. Strawberries are so good this time of year, and this is great way to use them! When I realized that I was out of blue sanding sugar, I made my own. It’s so simple. Just add some food coloring to regular granulated sugar and mix it well. You can make it as bright or pale as you want it the color. 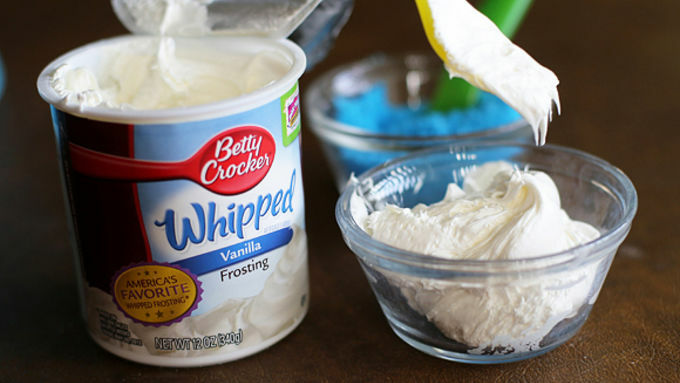 Betty Crocker™ Whipped Vanilla Frosting is perfect for dipping the strawberries in. Let the strawberries set in the refrigerator until you're ready to enjoy them. This is an impressive treat that literally takes no time at all — and they’re pure eye candy for your table! For an adult version of these strawberries, try strawberries that have been soaked in champagne. 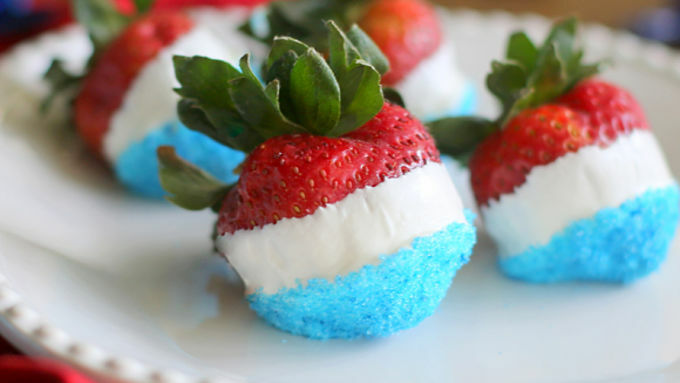 Try those with the red, white and blue decorations for an extra-tasty combo. Enjoy Red, White and Blue Strawberries while celebrating all the patriotic holidays this year, from Memorial Day and the 4th of July, through Flag Day and Veteran’s Day!